View the Toy Insider’s Expert Review of Patriot here! Your child will delight when this classic Patriot Rocking Horse comes alive with a swishing tail and moving mouth! 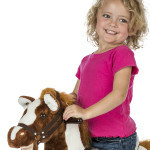 Patriot is a classic rocking horse that features soft plush over a lightweight, sturdy foam core. 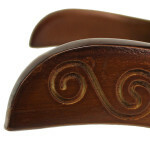 He sits on a beautiful wooden base with detailed scroll engraving. With a press of his ears he sings the exclusive “I’m a Little Pony” song, says 6 fun phrases, and makes realistic horse sounds. Your child will be amazed by Patriot’s moving mouth and swishing tail. Other features include a full body bridle and reins, high-back saddle with cotton trim, metal stirrups, wooden handles, and a realistic mane and tail.